Sponsored by the Bitterroot Public Library and The Family of Marjorie A. Crawford Free and open to the public, this year's lecture series will be given by Chapter One Book Store proprietor, Shawn Wathen. Schedule: October 7th, 2014: Notes from Underground by Fyodor Dostoevsky November 4th, 2014: The Great War and Modern Memory by Paul Fussell January 13th, 2015: Return of the Soldier by Rebecca West Suggested (but not required) reading The Penguin Book of First World War Poetry February 10th, 2015: Noonday Cemetary by Gustav Herling March 10th, 2014: The Armies by Evelio Rosero April 7th, 2015: City of Angels: Or, the Overcoat of Dr. Freud by Christa Wolf Classes will be held in the basement meeting room of the Bitterroot Public Library (west entrance) from 9:30--11:30 a.m. Books are available through the library (limited number) or at Chapter One Book Store. Call 363-5220 or 363-1670 for more information. Join us for a reading group discussion of The brothers Karamazov by Fyodor Dostoeveky! The brothers Karamazov, the last and greatest of Dostoevsky's novels, chronicles a bitter love-hate struggle between the outsized Fyodor Karamazov and his three very different sons. It is above all the story of a murder, told with hair-raising intellectual clarity. Fyodor Dostoevsky has a Legacy Library. Legacy libraries are the personal libraries of famous readers, entered by LibraryThing members from the Legacy Libraries group. » Fyodor Dostoevsky's legacy profile. Fyodor Dostoevsky is currently considered a "single author." If one or more works are by a distinct, homonymous authors, go ahead and split the author. 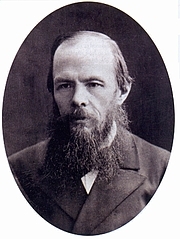 Fyodor Dostoevsky is composed of 604 names. You can examine and separate out names.